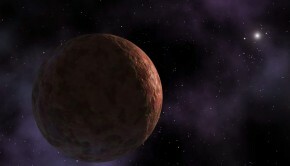 Dwarf planet 2007 OR10 is the largest body in the Solar System to remain nameless. Despite its size 2007 OR10 has still to be officially recognised as a dwarf planet. Dwarf planet 2007 OR10 was first discovered in July, 2007, by the Caltech team of Meg Schwamb, David Rabinowitz and Michael Brown using the Palomar Observatory in San Diego, California. At roughly 1,300 kilometres (800 miles) in diameter, dwarf planet 2007 OR10 is a relatively substantial body. It orbits the Sun at an average distance of 67 Astronomical Units (AU). 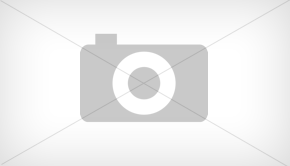 One AU is the distance between the Earth and Sun or eight light-minutes. It takes 2007 OR10 an amazing 551 Earth-years to complete one trip around our local star. 2007 OR10’s surface temperature has not been precisely measured. It is probably about 30 degrees Kelvin (minus 240 degrees Celsius) depending on where it is in its orbit. Michael Brown originally nicknamed 2007 OR10 Snow White as he presumed that the body was coloured white. After it became known that the dwarf planet was a dark red colour the name ‘Snow White’ was dropped. The surface of 2007 OR10 is believed to be comprised of methane and frozen water. A coating of methane is thought to be responsible for the dwarf planet’s colour. It is maintained that during 2007 OR10’s perihelion its proximity to the Sun melts the methane giving it a brief, tentative atmosphere. Despite having the required size and probably the necessary hydrostatic equilibrium, dwarf planet 2007 OR10 is still not officially recognised as a dwarf planet. 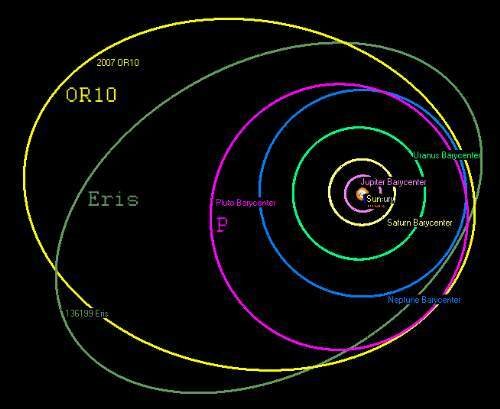 That fact that 2007 OR10 has got no known satellite means that the mass of the Kuiper Belt Object remains unknown. This makes it much more difficult to give the body dwarf planet status. Visit Wikipedia for more information on Dwarf Planet 2007 OR10.